There are many pros & cons to owning a scooter (or a moped) based on where you live, how far you commute, and what you’re buying your first scooter for. 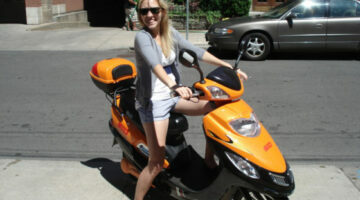 Here are my best tips when it comes to choosing the best scooter for your needs. Do you really need rental car insurance? You know they’re going to try to sell it to you at the counter right? Here are reasons you should purchase car rental insurance and when it’s not necessary. If you’re pregnant and confused about how to buy newborn car seats (as most first-time parents are), these tips will come in handy! Whether you decide to buy a used or new newborn car seat, here’s what you need to know about the proper fit, recline angle, and which direction baby’s carseat should face. See the 3 most important things to include when writing a letter of recommendation for a friend or colleague — and the things to avoid mentioning. Plus reference letter examples, templates, and tips that will make the process of writing a reference letter quick and easy for you! Who Knew There Were So Many Options For Renting Movies? Here are some of the modern, high-tech ways that you can rent movies these days… whether you have a computer or a TV.